The backing should be 3 to 4 inches bigger than your top all the way around. For example if the top is 60"x 70" then the backing should be 68" x 78". The back should have all the selvaged cut off before it is pieced and should be 100% cotton fabric. The top and the back should be pressed and squared. Edge to Edge quilting is 1.75 cents per square inch plus the cost of batting. 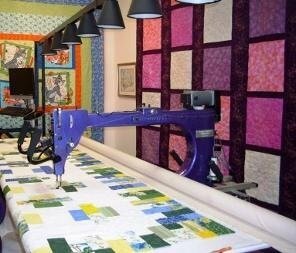 There is a minimum quilting fee of $50.00. We use Hobbs 80/20 batting that is made in Texas organically with no pesticides. The price of the batting varies by which kind is used. We currently have 96" in natural, 108" in natural, and 108" in white in stock. We only use our batting. 1. For us to press the backing or the top. 4. Square up the quilt after quilting.